The second blow seems to be more decisive in nature. This has been struck at the base of the commonly held beliefs of the discipline of economics, largely informed by the neo-liberal doctrine; the very essential ideological foundation of finance capital. The massive dimensions of the US housing market collapse and the inability of the mainstream economics practitioners to predict or even diagnose the same has spelled doubt on much of the teaching and research in economics that have been carried out by frontier institutions and universities, particularly in the north but not exclusively so. The celebration of more and more securitization of assets on the basis of unchanging real outputs and piling up derivatives on weak asset bases has been brought to a screeching halt, whereby the discipline is now more critical and apprehensive of the par excellence financial models, which have dominated the discourse for nearly three decades. The neo-classical assumption of full employment is once again under critical focus. The germane debates during the times of the Great Depression of the 1930s are being referred back and the search for alternative paradigms of economics is rejuvenated. The Keynesian thought plays an important role in this for two reasons. First, it was the theoretical interventions and policy prescriptions of John Maynard Keynes and his followers that rescued the world economy from the clutches of the Great Depression. This is not to ignore the important role that massive fiscal expansion led by war expenditures (prior to the Second World War) played in this regard. The second reason why Keynesian policies have to be re-engaged and re-imagined is due to the fact that neo-liberalism led by the interests of finance capital rose to dominance precisely by undermining Keynesian policies and building on the latter’s shortcomings. The New Keynesians are actually closer to the neo-liberals in their assumptions than Keynes’ original propositions. In this context, Keynesian Reflections: Effective Demand, Money, Finance and Policies in the Crisis (ed. 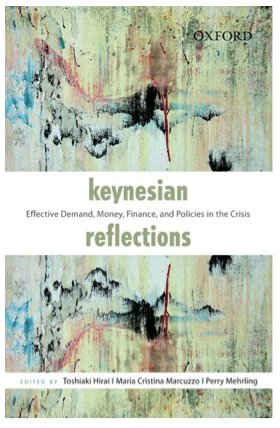 By Toshiaki Hirai, Maria Marcuzzo and Perry Mehrling, OUP, 2013: ISBN 0-19-809211-3) presents as an excellent endeavour to rediscover Keynes, both the positives of the theory and the negatives of the way Keynesianism was practiced in policy-making. The collection of articles in the book engages meaningfully in the central debates of macro-economics and also foregrounds several paradigms of economic policy-making which were lost due to dominance of neo-liberalism in the recent past. The discussion of the macro-economic experience of various countries like Japan, US or India and the wide range of policies adopted to tackle the crisis also places the discussion in a global perspective of policy-making. Practicing Keynesian macro-economics policies has always been an area of contention. The Patinkin-Meltzer debates on what Keynes meant when he prescribed that government expenditure, and in general, expenditure, should increase when an economy is in a depression, is illustrative of this dilemma. Meltzer’s argued that Keynes was in favour of the investment route in order to enhance aggregate demand in the economy, especially in one afflicted by a depression. Patinkin countered this by saying that this interpretation of Keynes stretches the point too much as it is not possible that private investments will increase at times when ‘idle factories’ i.e. unutilized capacities, are plenty in number. Rather, the way an economy can come out of depression is by increasing consumption levels and the rest would automatically follow. Such consumption-led growth, often financed by credit and not through a rise in incomes, results into bubbles based on false expectations and undervalues risks, thereby becoming an unsustainable proposition. This is also a recipe for recurrent economic crisis. The experience of the US, since the 1990s, bears testimony to this prognosis. Backhouse and Bateman in their chapter engages with this debate using Keynes’ unpublished letter to the Dutch company N. V. Philips, to which he acted as an adviser during the Depression years. The company asked for a clarification on Keynes advice to them that it is only through countercyclical investments that the depression can be overcome. The company was not convinced that more investments and addition to manufacturing capacity was a good idea when much of the existing capacities were already in excess for immediate needs. Keynes in his response (Keynes Papers, File BM5) reiterated that only through a reduction in the long-term interest rates and a consequent recovery of investment can the economy emerge from the crisis. He further clarified that by investment he does not mean so much of private investment in manufacturing, which was already excess, but stresses on the requirement for infrastructure investments like ‘building, transport and public utilities’. He reckoned that even for these investments to occur, often by the government, the cost of borrowing should be low and high interest rates in the economy presents as a barrier in this regard. Infrastructure investments are expected to create jobs leading to higher aggregate demand and also increase the productivity of private capital, which in turn further boosts the economy. A monetary policy, which raises the interest rates during depression and hence the cost of credit, is therefore not conducive for an economic recovery. The dominant argument from the Keynesians is however for a expansionary fiscal policy and not for monetary policy. Kregel makes a significant intervention in this regard with his examination of whether monetary policy alone can lead an economy out of crisis. He says that there is no doubt that monetary policies like the Zero Interest Rate Policy (ZIRP) adopted by the Japanese Central Bank in the 1990s and the Quantitative Easing (QE) policy adopted by the US after the financial crisis have their origin in Keynesian ideas. At the same time, these policies have not been very successful in terms of orchestrating an economic recovery and therefore the efficacy of these policies need to be reviewed. Kregel also reminds us that Keynes himself had also evolved, during the Great Depression years, with regard to his position on the effectiveness of monetary policies in enhancing investments. Keynes also pointed out that very low interest rates without a revival in the ‘state of confidence’ can also put an economy in a liquidity trap where investors prefer to hold money instead of bonds. Kregel argues that Keynes’ optimism with monetary policy in the Treatise was misplaced and his skepticism expressed later is more realistic. Specifically, the confidence of investors in the US after 2008 is down precisely due to presence of large volumes of ‘toxic assets’ in the markets, which erodes ‘trust’. Even a zero real interest rate in the US for the last few years has therefore failed to attract higher levels of investment. State versus Market: a false binary? The untenable assumption of neo-classical economics of full employment in any economy and consequent inflationary tendencies of public expenditure clearly needs to be debunked in order to formulate policies which can meaningfully address the ills of a depression. The Keynesian tradition lucidly does this through the emphasized argument of enhancing aggregate demand through counter-cyclical expenditures during a slowdown. Much of these expenditures have to be undertaken by the government, as the above lines from the General Theory points out. An economically pro-active State or a ‘Large State’ is therefore unambiguously required for engineering a fiscal stimulus, contrary to the usual reasoning of neo-liberalism. The fact that money and bond markets will not clear on their own, particularly at times of a recession, is also pointed out through the Keynesian argument of ‘liquidity trap’, where even at very low interest rates, investors are more willing hold money than undertake investments. Government intervention in the bond markets is essential in order to revive the economy and large scale government borrowing and spending creates the environment where investments, employment and incomes increase. Wray argues for a ‘Big Government’ that operates in public interest as proposed by Minsky. Sen in her piece stresses on the role of private speculators in the financial and other markets in fuelling economic crises. Speculation has increased greatly across the globe over the last few decades with increasing reforms of markets, creation of new commodity future markets and relaxation of regulations regarding operations in such markets. In the US, the regulations on banking and particularly the clear separation of banking and financial operations that were part of the Glass-Steagall Act of 1933 were considerably watered down since the 1980s. This allowed the participation of banks in more risky operations like those in the derivative markets. Speculative activities multiplied manifold and diverted larger proportions of finance away from productive investments. Keynes in his policy prescriptions during the Great Depression had clearly argued that the optimum volume and mix of investment that is ‘socially relevant’ may not be the same as that which maximizes ‘private profits’. It is therefore natural that in the absence of strong regulations, there is an amplification of short-term speculation in various markets at the cost of real economic production. Several authors in the volume argue for stronger regulations in the financial and commodity futures markets which have emerged as the sites of big ticket speculation globally. This adds to the reasons why one should pitch for a ‘Strong State’ that can keep the markets in its leashes and not get undermined the other way round as has happened under neo-liberal thinking. The post-crisis experience in US and the rest of the world however indicates that even a mammoth financial collapse like the 2008 crisis does not automatically help to put in place a State that can keep markets under control. While theoretically neo-liberalism and free market worship may have suffered a setback, in the domain of policy-making, the dominance of finance has not ended. This is well-illustrated by the massive bail-out of the Wall Street after 2008, that essentially amounted to a ‘socialization of losses’; losses which were caused by the caprices of the bullish CEOs of financial institutions and their pack of trained speculators. This experience, along with the clamour for more austerity, points out that the binary between the State and the Market may not always be the correct paradigm to start from if one has to remedy the present crisis-ridden situation. This is more so in a historical context where the State has primarily acted to facilitate the ‘free market’ and when it grows big and strongly intervenes, it does so to protect the interests of finance capital. The real binary may actually be identified if one investigates the political economy of state policy. The true contradiction does not lie between the State and the Market but in the social contradiction between capital and labour. To be more precise, the binary is between finance capital on one hand, represented by the global financial elites and their beneficiaries, and the working class, salaried middle classes, petty producers and the unemployed on the other. The global income distribution has clearly moved in the favour of the former party. Without a tilt in the balance of power against the financial elites, there is little chance that the State will remotely adopt Keynesian or other alternative policies to address the crisis. In the aftermath of the crisis, there has been myriad manifestation of class struggles globally, one example of which is the Occupy Movement in the US. Without increasing pressure on the governments through such struggles with more clarified objectives, the majority of the population cannot hope to change State policies in a direction that needs to not only bring recovery and stability to the economy but also lead to more equitable growth and distribution of global income and resources. It is beyond doubt that any social scientist concerned with the current crisis has to engage more vigorously with the political economy of such a desirable social and economic change. Arindam Banerjee is Assistant Professor at Ambedkar University Delhi. The review was published in The Book Review in 2014.